Maharaja Sayajirao Gaekwad was the first ruler to introduce compulsory and free primary education in his state in Year 1906, placing his territory far in advance of British India. His prosperous library became the core of today’s Central Library of Baroda with a network of libraries in all the towns and villages in his state. The Central Library of Baroda was built in Year 1910-11. 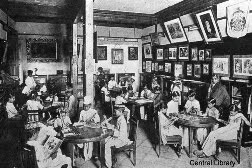 It was one of the first public libraries to be set up in India. It shares a unique resemblance to the World’s finest library, the prestigious Library of Congress, Washington, USA – both boast of a distinctive shelf-rack and glass flooring system that is disaster-proof, allow for as much natural daylight as possible and, most importantly, is extremely user and book-friendly. The Central Library was actually born in Lukshmi Villas Palace of Maharaja Sayajirao Gaekwad, who were the pioneer of public library movement in India that began in 1906. He also donated 20,000 books as a ‘seed’ collection to get Library on its feet. The Library was actually housed in Sarkarwada, but now its moved just opposite to it. When Maharaja Sayajirao Gaekwad was in the United States, he met and was impressed by William Alanson Borden, then Librarian at the Young Men’s Institute of New Haven in New Jersey. In the winter of 1910, Borden was in Baroda, planning the ambitious Central Library. It is believed that along with Borden even Sir Edward Lutyens (the builder of New Delhi) as well as three architect-planners from Baroda State were involved in the design of the Central Library. The library building was finally ready in Year 1931 and was built at the cost of Rs. 4 lakh and an additional Rs 1 lakh spent on furniture and one more lakh on books and magazines. The Library is situated in Mandvi Area, near to Champaner Gate in the Old City. The stack room is the main gem of Library which is lenghtened to 4 floors and is 85 feet long, ~35 feet broad and with 350 slotted angle racks which can house 3.5 lakh books. The Stack house is designed a warehouse with long, glass-paned windows and is oriented in North-South Axis to get the maximum daylight. In Old days, the area facing windows was landscaped with shrubs and trees which processed moisturized air into dry air, keeping library’s temperature mild. Library has wooden roof and stacks are separated, so one can find books easily. The entire structure was designed to exact specification and executed by J. Snead and Co., USA, who also designed the Library of Congress, Washington. The Ground floor has kota stone Tiles and the upper 3 floors are fitted with huge glass floor tiles. These tiles ensured that the metal armature and shelves on which the books are stacked do not heat up in the summer and freeze in the winter, and so keeping the books stocked at an even temperature. There are 719 tiles fitted, which are 35″x35″x2″ of size each and were imported from Belgium. Some of the tiles are damaged as of regular use from more than 80 Years. *When Earthquake shocked the entire Gujarat in Year 2001, the amazing thing was no book was moved from its rack in the Library! Being the Oldest Public Libraries in India, the Central Library aslo holds some priceless books from its big collection. A copy of the Indian Constitution with original signatures of the MPs, Census Reports and Annual Reports from Baroda State is also there. There is also a mini book cabinet which is approximately 2 feet high and just a foot wide which holds 73 miniature books. The Largest book in Library is of 2 feet by 1.5 feet – Indian Princes’ Edition of Empress of India Memorial Volumes (1887-1901), subscribed to by the Maharaja Sayajirao Gaekwad and donated to the Library. The Central Library is now managed by Directorate of Libraries, Government of Gujarat. 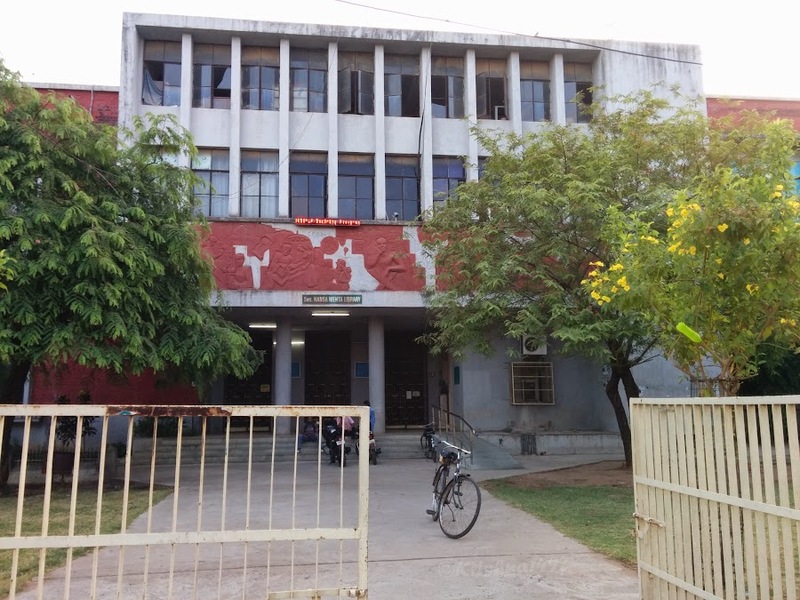 The state also has a unique distinction of being the only one in India with two state libraries – the one in Vadodara (Baroda) and the new one in Gandhinagar, built in 1982-83. The Library is now well-modernized and has implemented computerized catalogue and also has Video Facility in Children’s Section. The Library currently hold more than 8000 active members. something is really marvelous for the readers… but very few peoples know about it..which is heaven for the readers..